Town boss Jamie Fullarton admitted it was disappointing to see two points snatched away in stoppage time after Leyton Orient equalised late on in their 1-1 draw with FC Halifax Town at The Shay. Dayle Southwell’s penalty midway through the second-half looked to have set Town on course for a win, but substitute James Alabi struck in added time to preserve Orient’s unbeaten start. “When you’re emotion-driven and you’re 1-0 up going into injury-time, then it is (hard to take),” Fullarton said. “I’m not frustrated, disappointed or angry with the players, it’s for the players because yet again, they’ve gone to the well. “Yet again, particularly second-half after we discussed one or two areas we had to improve on to make the game plan work better, we got ourselves in the game. “Whatever way you want to look at it, it’s a top-of-the-table clash. I think it reflects the progress we’ve made that Leyton Orient, who were joint-top, are coming here and getting a point and it’s as if they’ve won a cup. “You’ve got to give credit to them (Orient) because first-half they were better. “With the alterations at half-time and the way the players applied it we probably edged it second-half. Orient were the better side in the first-half, which Fullarton put down to a combination of Town being below-par and Orient playing particularly well. “They’re undefeated and top of the league at the time for a reason,” he said. “They’ve come here and shown signs and spells of that. “We understood what they were going to be like and what they were going to do, they were no different to what we expected. “It’s how we dealt with that and, although we under-performed for what we are or what we’ve shown, we were still 0-0 at half-time. “We showed a resilience and understanding of our defensive shape, and second-half, with one or two areas we altered, we not only stayed in the game but we went and took the game and created opportunities. “But I think both teams will be disappointed in both boxes because the keepers didn’t have a great amount of saves to make. When asked what changed for The Shaymen to have improved after the interval, Fullarton said: “Understanding and appreciating what was being asked of them, and just the adaptation. “It’s very easy for a coach or a manager to say ‘this is what they are, this is how they do it, this is what we’re going to do, and this is why we’re doing it’. “But what can’t speak can’t lie, and when they see it, the penny drops and it’s those clear messages at half-time that guide them and simplify it, and resulted in us being better second-half. “When you get yourself in that position, 1-0 up in injury time, it’s disappointing (to draw), but even the fact we’re disappointed with a draw against Leyton Orient, who were top of the league at the time, tells you where we’ve came from and to. When asked if he agreed with the decision to award his side a penalty for a foul on Matty Kosylo, Fullarton said: “A good indication of whether or not it is, is the reaction of the team that is guilty of it. “The fact that Leyton Orient didn’t challenge or appeal against it suggests it was. “It’s no different from Wrexham when their players were walking towards the halfway line when we scored the goal, because they felt it was, and then had a big sigh of relief when the referee, for whatever strange reason, decided there was a foul on the keeper when no-one was standing next to him. Orient’s equaliser was the sixth time already this season they have scored in the 85th minute or later. “You’ve always got to add context to facts,” Fullarton added. 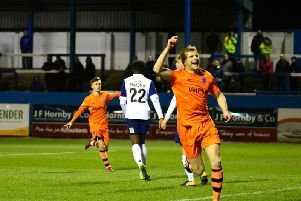 “Recently they scored two goals against Solihull Moors, who were down to 10 men, and already used their subs. “If you watch the games, it puts context to it. “Whether it’s the first five minutes or the last five minutes, I feel our players are conditioned to cope for 95 minutes. “There wasn’t an awareness we needed to be aware just for that five minutes, otherwise we’d just fast-forward to the last five minutes!